Let Chicago have its Magnificent Mile. Galena, IL, will proudly claim its Helluva Half-Mile! 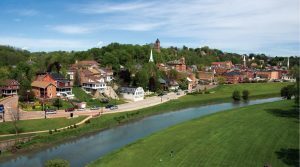 Downtown Galena, IL, offers an incredible array of dining, shopping, and things to do that you will love. With more than 125 shops and restaurants, plus historic sites, impressive 1800s architecture, and fun annual events, you will find more than enough to keep you busy during a getaway with us! Exploring downtown Galena, IL, is just one great thing to do when you visit our area. Request a copy of our FREE Vacation Guide today for our best recommendations on dining, shopping, attractions, and more! When you explore downtown Galena, IL, you’ll find a wide variety of exceptional dining options. Whether you’re in the mood for upscale Italian, casual pub grub, a fresh lunch, or something totally different, you’ll find it in our busy town center. In addition, Main Street is filled with unique spots for sweet and savory treats, including popcorn, pasta, cheese, chocolate, ice cream, and candy shops. When you visit our area, you’ll love window shopping as you make your way through town. In addition to several excellent culinary shops on the Helluva Half Mile, downtown Galena, IL, features plenty of other great shopping opportunities. You’ll find antique shops and art galleries, plus unique boutiques to fit every style. You’ll also find stores carrying interesting hats, fun jewelry, and special gifts you won’t find anywhere else! 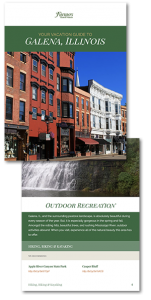 Downtown Galena, IL, is also a great place to go to learn more about our area’s local history. On Main Street, you’ll find historic 19th-century buildings and plenty of ways to learn about all of them. One of our favorite tours to recommend is a Main Street Walking Tour with General Grant. An impressive Grant reenactor will tell captivating stories about Galena’s rich history. Or, if you want to learn about Galena’s darker past, do something a little different and take a hair-raising ghost tour or haunted pub crawl at night! Wine Lovers Weekend in March and the Night of The Luminaria in December are two of the largest annual celebrations, but you’ll find plenty of exciting annual events in downtown Galena, IL, throughout the year. In addition to these great downtown attractions, you’ll also want to join us for President Grant’s Birthday, the Great Galena Balloon Race weekend, the Midwest Garlic Fest, Historic Homes Tours, Nouveau Wine Festival, and so much more! 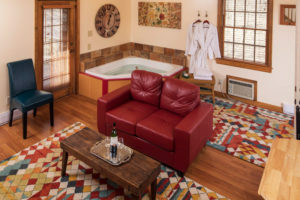 When you’re looking for a great place to stay in downtown Galena, IL, you’ll find plenty of unique lodging options, including a great selection of bed and breakfasts. Each has its own special characteristics and qualities to discover. And, many of them are just steps away from all of the other great things to discover downtown. Explore Downtown Galena, IL, and Stay at the Farmers Guest House! If you’re looking for a historic bed and breakfast just a short walk from the very heart of downtown, you should stay with us! Since 1867, Farmers Guest House has kept its doors open to all varieties of getaway travelers and passersby. Our inn has an unmatched hospitable atmosphere, unique history, and award-winning breakfast you can’t miss. Our guestrooms each feature unique furnishings and styling, but they all include the amenities you look for in a home away from home. Learn more about our inn today. Then, book your next stay with us!